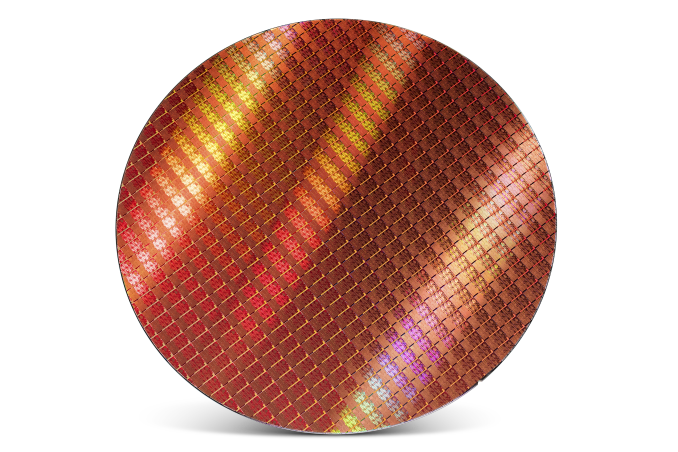 For some intrepid enthusiasts, this is the chip from Intel we’ve been waiting for. I foolishly predicted that Intel would never create an overclockable Core i3, because it had the potential to drive sales away from high-margin products. But here we are, Core i3-7350K in hand, and the ability to drive almost 5.0 GHz without too much trouble. This raises a couple of questions: just how close is it to the cheapest Core i5-7400 out of the box, which is only a few dollars more, and how close is it to the Core i7-2600K, a favorite chip among enthusiasts who have not yet upgraded. For the previous generation of Intel products, we reviewed the Core i3-6100TE. This was a low-powered Core i3, but it was paired with the SuperMicro C7H170-M, a motherboard that enabled adjustment of the base frequency from 100 MHz to 130 MHz and up. This was the first chance in a number of generations to test what would essentially be an overclockable Core i3 product. There were many teething issues, as overclocking via the base frequency is less stable than by the multiplier, plus the motherboard options were not the easiest to work with. However the final conclusion was that the Core i3 parts, while having two cores and hyperthreading, have difficulty keeping up with the Core i5 in tasks where having actual cores matter. For gaming, especially 1080p or Full-HD gaming, there was a small difference in favor of the Core i5, and the indication that with DX12 enabling multi-core gaming in a nicer way before, a gap would likely emerge over time (but mainly for high-end games for now). As a result, we postulated that Intel would never release a Core i3-K product: doing so would potentially drive sales away from the i5-K, as here is a part that could perform just as well for $60-$70 less, which users would have in pocket to upgrade a graphics card instead. Can Die Size Account for the Difference? Intel, from the outside, seems very margin driven: keeping those numbers above 60-65% in every department seems to be key to progress. As a result certain projects come and go, and others with potential have a small grace period but the bottom line is performance and strategy. One could argue that potentially offering an easy route for users to migrate down from a Core i5-K to a Core i3-K could affect that bottom line: users are paying $60 less per unit, and that’s a $60 loss per sale. This is one way of looking at it – another is considering that the Core i3-K parts are dual-core by design, and cheaper to make. Disclaimer: The data for 2+2/4+2 Kaby Lake and Skylake for the following analysis were derived from high quality images of each die, and thus subject to error. Italicised numbers are calculated from images and represent more of a 'peak' die size. Data taken from delidded images varied wildly, from 105mm2 to 130mm2 for the 4+2, so should be taken under caution. *** Broadwell 4+2 designs don't seem to exist. The two mobile parts (we don't have access to) that fit this description are likely to be cut down 4+3e parts. Taking data from available images on delidding the dual core parts and quad core parts, it’s clear that the new generation of Kaby Lake processors are physically smaller than Skylake. But the difference between the Core i5/i7 core design (known as 4+2) and the Core i3 design (known as 2+2) isn’t that much. With a die size of 126.15 mm2 for the quad core and 98.68 mm2 for the dual core, the die sizes of the two chips are relatively close, with a difference of just 27.47 mm2. This makes the dual core design 78% of the quad core size. 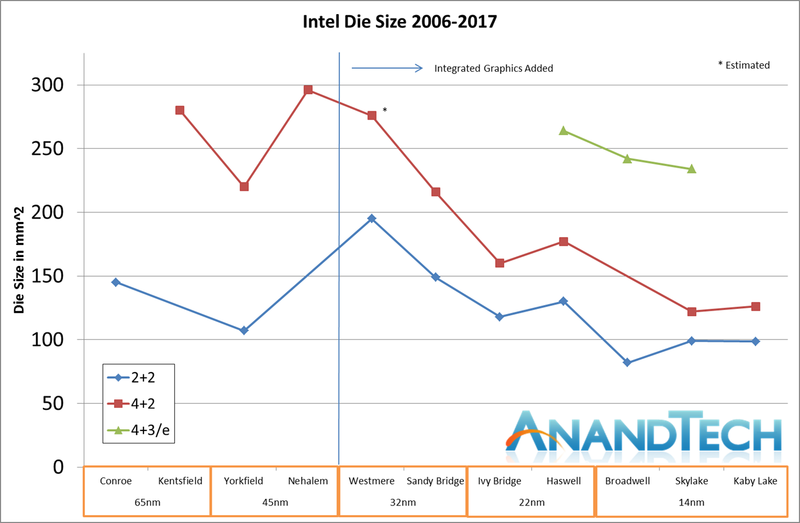 If costs scaled linearly with die size, then die size difference between the two (22%) equates to $52.75 of the cost of the i5-7600K list price. This is similar to the list price difference between the two chips as a whole. As we have this data for the first time, it is interesting to see that Intel’s new method of ‘Process-Architecture-Optimization’ rather than Tick-Tock, is yielding results. 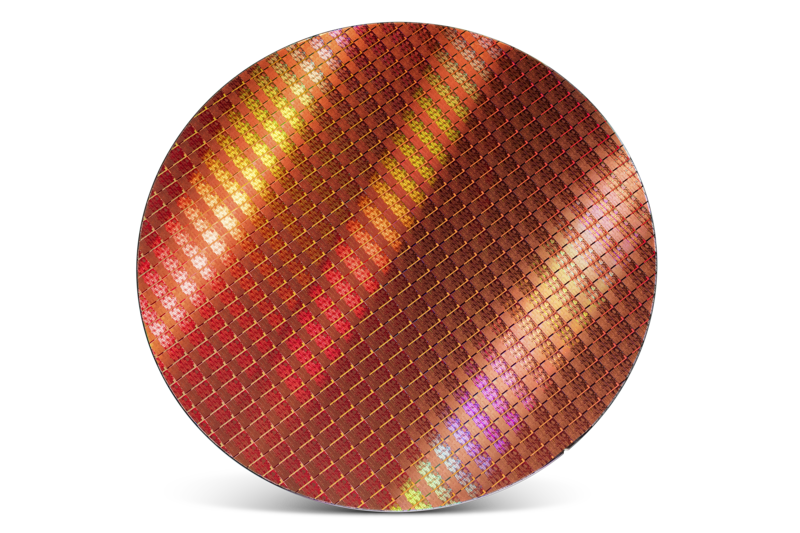 The Skylake 4+2 die size is similar from 122 mm2 to 126 mm2, and goes in line with the fact that Intel has officially stated that one of the key features of the new 14+ process is that the transistors are more ‘relaxed’ and there’s no decrease in density. Exactly what that means is likely under wraps for all but Intel (or Chipworks). But the difference between Kaby Lake 4+2 and 2+2 also means that we can get a rough number for the die area required for two cores. In this case, two Kaby Lake cores plus L3 cache (plus periphery required for another two cores) are approximately 27.47 mm2. This makes the two cores in the dual core design approximately (given sufficient error margin) 27.8 % of the die. Doubling the die size for the four core version means that the CPU cores take up ~43% of the design. 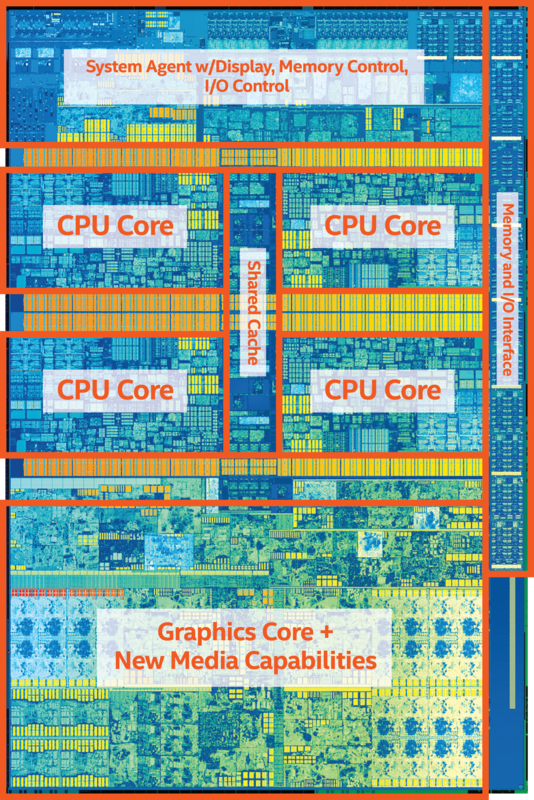 It's worth noting that using Intel's official die shot of the quad-core above puts the core area at around the 33-37% mark, depending on how you count the interconnect. The GPU area is almost identical (within 1%) of the core area as well. Our numbers here are calculated from delidded CPUs rather than official numbers, as Intel sporadically gives out such numbers these days (it depends which department is making the announcement, oddly) which makes our results more of an upper limit which is important to consider. Because of the image above, we could arguably call the GT2 graphics inside the quad core design equal in size to the CPU cores (which seems plausable) at 54.94 mm2, then using the full dize size measurement above, it leaves 16.27 mm2 for the memory controller, system agent, and other requirements. If we do the math back into the dual core design with the same graphics core, we get 16.27 mm2 for the memory controller and other requirements as well. For clarity, numbers in bold are measured; italics are estimates, and others are calculated. So if the difference in die size can account for the price difference and won’t affect margins, what’s the bottom line here? Ultimately $60-70 per sale lost is a drop in revenue. However, it also depends on yields, and how the different CPUs are being binned. That information we won’t ever have. What we do know is that the Core i3-7350K is coming onto shelves at the end of January/beginning of February, rather than with the rest of the Kaby Lake CPUs in early January. So perhaps, ultimately, the effect of offering a Core i3-K in this case is minimal to Intel’s bottom line. But Where Does the Core i3-7350K Fit In? 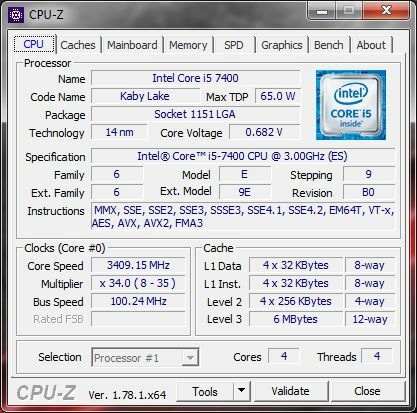 Intel's 7th Generation of Core CPUs, which often goes by its internal code name 'Kaby Lake', stretches from 91W on the mainstream desktop down to 4.5W for notebook processors, all using the same underlying technology in different core and integrated graphics configurations. The i7-7700K is the top part of this processor family, featuring four cores with hyperthreading, and we move down through the Core i5 and Core i3 parts. 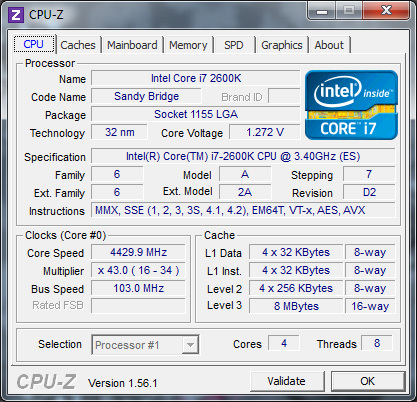 This time there are three overclocking processors, with the new one being the Core i3-7350K. The Core i3-7350K is the odd member of the stack. It sits as the only processor with a TDP of 60W, and is priced very close to the Core i5-7400/7400T. The comparison between this two (we were able to run limited tests on the i5-7400) will be a key aspect to this review given the pricing – will an extra $14 for two more cores offset the fact that the Core i3-7350K has a super high base frequency? Having 4.20 GHz as the frequency of the Core i3-7350K is interesting: as a Core i3, it has no turbo mode per-se, and it operates either in a low power mode (800 MHz or so) when idle or at full throttle when needed. This has some advantages over a turbo mode by having peak power being the only consideration, especially when combined with Windows 10 and using Intel’s Speed Shift technology to ramp up to the top speed quickly. Aside from the physical cores, the Core i3-7350K has less cache than the Core i5-7400, which is something to note. One other pertinent comparison I want to make in this review is with the perennial favorite of DIY system builders for the last seven years or so: the Core i7-2600K. This is the high-end processor from the Sandy Bridge family that is known for being a good overclocker and a part which a lot of users are still on due to the lack of distinct performance improvements over the recent Intel microarchitectures. For most users still on these parts, the upgrade to a newer platform does not offer a substantial enough performance uptick to validate the outlay. However, at one point, there is going to be a Core i3 performance CPU that matches the Core i7-2600K. I want to find out if that time is now, or how far it might be away. 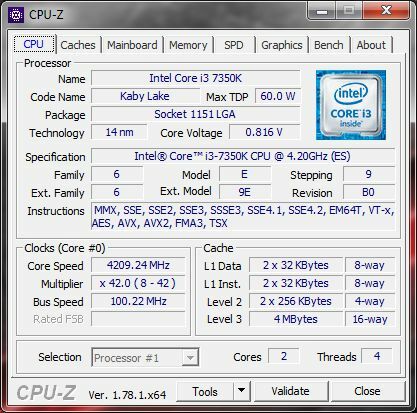 In simple numbers, the Core i7-2600K has a base frequency of 3.40 GHz and has a turbo up to 3.8 GHz. The Core i3-7350K is at 4.2 GHz, giving it both a frequency advantage and 35%+ advantage in instructions per clock (IPC) by virtue of being so many generations ahead. Aside from the L3 cache difference, and the move from DDR3 to DDR4, is there a sufficient frequency and IPC increase for the Core i3 to match the golden processor of yesteryear? This review will solve that question. For readers that want a more in-depth take on Kaby Lake as a platform, we have a dedicated article full of information for you. We also have other articles in our Kaby Lake bonanza. This chip is 6 years late. Back when sandy bridge was the newest chip, a dual core i3 was a super relevant choice for gaming, a quad core was overkill. Today, for gaming builds, a i5 chip is almost always a better choice, unless you only play games that are single threaded. And the i3 is more power hungry then locked quad cores. "If you need great single-threaded performance with some mild multi-threaded, get the Pentium or i3. If you need great multi-threaded performance with great single-threaded, get an i7." In the late 90's into the early 00's, when people would travel for hours carting their PC to a LAN gaming event with 100's (or even thousands) of other people, having an OC'ed machine was indeed cool amongst that Geek crowd.